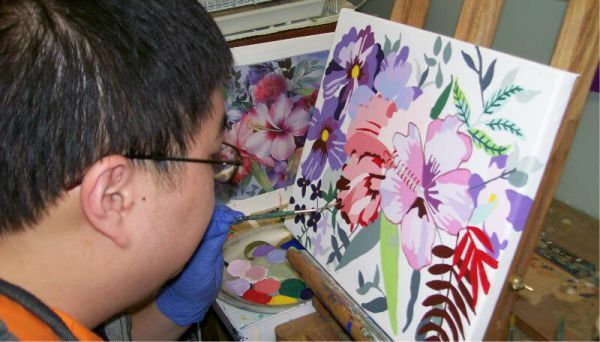 Artists at Pyramid, Inc. work independently under the guidance of trained professionals, creating original art in a variety of mediums, including painting, sculpture, fiber, costume and fine jewelry, mixed media, ceramics and crafts. Artists are paid a commission for works sold. Artists regularly exhibit their work throughout central and north Florida and beyond. Their work is also available in the form of gallery quality reproductions, greeting cards and calendars. Their work is a means of expression and source of self‐ esteem for students, a source of pride for families, and a demonstration of ability to the public. Prints may be purchased on this page; originals and other artwork may be purchased at individual Pyramid centers. The visual arts have provided an unparalleled means of communication for non‐verbal students and opportunity for honest expression for those whose insights were never sought or valued. Pyramid artists earn commissions – and tremendous self‐esteem.